Welcome, today, we’ll be pitting Weebly who have been around forever, against GoDaddy who is a huge player in the domain name industry but a relatively new entrant into the website builder space. As usual, these two website builders have plenty in common but it’s the differences that’ll help you decide which is the right platform for your business or project. If you’re in a hurry, simply click any of the links in the overview table below and you can jump straight to that specific section. 2. Which is The Easiest To Use, Weebly or GoDaddy? 4. Are They Both Mobile-Friendly? 5. Weebly or Godaddy For an Online Store? 7. Which is The Most Search Engine Friendly? Weebly has a selection of modern, high-quality templates which are categorized as business, online stores, events, blog, and portfolio and while that may sound like a lot, I should point out that there isn’t actually that many in each category. Once you’ve chosen your template, you can begin customizing text, images, fonts, site color and the layout of your pages. GoDaddy on the other hand, seems to have a stronger focus on small business and they have a whopping 300+ templates to choose from such as home services, manufacturing, food & drink to name just a few. GoDaddy’s templates are brought to life with high-quality, eye-catching images but you’ll find they’re quite rigid and you won’t be able to make as many customizations as Weebly. Templates summary: Weebly has a selection of great-looking templates to help you get started but there isn’t that many of them. GoDaddy is more focused on business and has a much larger selection of templates but you’ll find they are less customizable. If you were planning on ease of use being your deciding factor, I’m afraid you’re going to be a little disappointed! You see, creating your site is just about as easy as it gets with both of these platforms although they do work in slightly different ways. Weebly’s editor is well laid out and if I had to pick, is probably the more user-friendly out of the two. Your chosen template will come with sample text and images which you can swap out for your own. You can drag over text blocks, images, and forms etc and drop them onto your page. 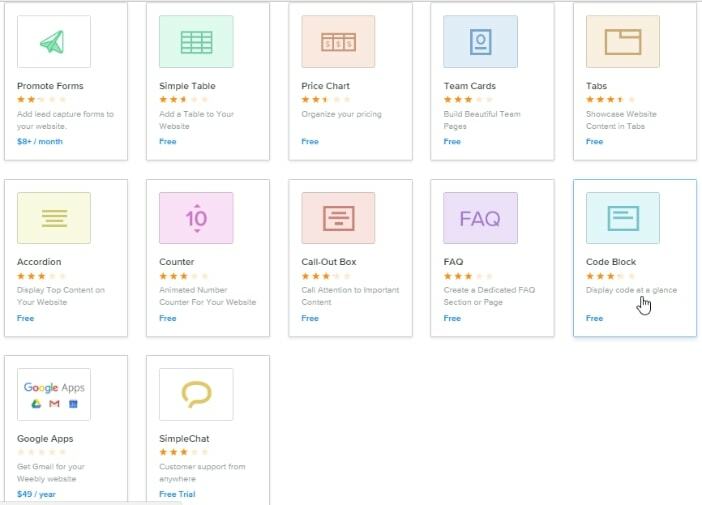 You can also add “sections” which are pre-made pieces of content allowing you to quickly build your pages and they include contact us, testimonials, and pricing charts. GoDaddy’s editor feels a little more “cramped” for lack of a better word in comparison but as I said above, it’s just as easy to use as Weebly. The main difference being, while Weebly gives you the choice of adding sections, this is only way to create your pages with GoDaddy. Once you’ve added a particular section which could be again could be contact, faq’s, testimonials (the list continues), you can click on a block of text or an image which can then be edited in the main control panel on the right-hand side of the screen. What you can’t do is, add additional headings or text onto the page like with Weebly as you’re a little more restricted. Ease of use summary: Weebly’s slightly easier to use but there’s not much in it. Both platforms allow you to get up and running as quickly as possible thanks to their beginner-friendly website editors. Once you’ve created the shell your website which will usually be made up with text and images, it’s time to start adding a little functionality. This could be a gallery to showcase your artistic talents, tools to help you manage and grow your business or even a store to sell your products online (we’ll be taking a look at each of the store offerings a little further down the page). Weebly allows you to add picture galleries, Google Maps, buttons, videos, a store, and social media icons all from your main website editor. When you need more features, it’s time to head over to the Weebly App Center. Here you’ll find plenty of “add-ons” including booking forms to allow clients to schedule their own appointments, a blog, visitor stats, live chat feature, testimonial builders, tables, and that’s only really scratching the surface. You can add any of the apps with just a couple of clicks although I should point out that some carry additional charges although you’ll usually find a free version or a free trial to test them out first. GoDaddy doesn’t have some of the bells and whistles that Weebly does which can be a good thing or bad depending on the complexity of the website you want to create. Rather than an app store, you can integrate your social media profiles, track your visitors, add image galleries, add PayPal buttons from the main screen. You can also feature client testimonials, pricing tables, and even add a menu which come in the form of sections as we discussed earlier. In addition, GoDaddy has created a user-friendly platform to help users get started with email marketing. Features summary: Both Weebly and GoDaddy offer you enough features to create a functional website but you’ll find a wider range of business and marketing tools inside Weebly’s App store. Yep, they certainly are. Once you’ve created your main site it’ll automatically look great and function properly on tablets and smartphones without any additional effort on your part. If however like me, you prefer to customize your mobile site then GoDaddy does offer a separate editor (albeit a basic one) that’ll allow you to remove certain elements of your page to help streamline the experience for your mobile visitors. Mobile summary: Your website whether created with either Weebly or GoDaddy will work perfectly on mobile devices. GoDaddy allows you to remove certain elements of your site for mobile users if you wish. Weebly is quite well known for it’s easy to use set of eCommerce tools and is often compared to more specialist eCommerce platforms. They allow you to sell both physical and digital products as well as offer your services. It has a shopping cart, you can create variants of your products such as size and color, offer customers flexible shipping options and accept payments through PayPal and major credit parts with the Stripe payment processor. GoDaddy also has an interesting offering when it comes to selling online. Your inventory will be updated in real time as you make sales, you can create coupons and offer customers discounts, offer multiple payment methods including ApplePay, and integrate a button on your Facebook page that’ll bring people directly to your store. A downside to GoDaddy’s store is that fact you won’t have the option to sell digital products such as MP3’S or ebooks. Another is that If you’re aiming for a slightly larger store (100+ products), you should be aware that while you can import products, you can’t export them making it difficult to leave the GoDaddy platform as you’ll have to spend a lot of time manually adding products and descriptions etc to your new platform. Weebly allows you to sell products on one of their lower priced plans (more on pricing in a second), and you can just pay a small commission on your sales making it a good option for micro businesses. With GoDaddy, you have to choose their top plan which could be work out expensive if you only intend to sell 10 or 20 products. eCommerce Summary: While both online stores are very user-friendly, if I were to create a store today with either Godaddy or Weebly, I’d choose Weebly as you can sell digital products, you have the option to export products if you wish to move your store, and it’s the cheaper option, especially for smaller stores. Weebly packs a powerful blogging feature which is great as a standalone blog or an integration into your main website. You can allow readers to comment, categorize your posts, add a sidebar for important information, add your bio, and integrate social buttons so people can share your posts. GoDaddy doesn’t currently have a blogging feature which I found a little disappointing. However, if you have an existing blog which you created elsewhere, you can add the “feed” to your website which means people will be able to see your latest posts etc. To be honest, this is far from ideal. Blogging summary: Weebly has quite a powerful blogging platform while GoDaddy doesn’t currently offer this feature. 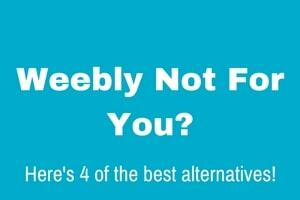 If blogging is important to you, your only option is Weebly. Building a website and getting it to pop-up in the search engines such as Google and Bing are two completely different skill sets. Having said that, some website builders do lay the foundation a little better than others to help your site along. This includes things like being able to name your pages, add descriptions to them, and have a sitemap generated which helps the search engine find their way around your website. Both Weebly and GoDaddy allow you to do all of the above so so far they are on an even keel. Weebly goes a step further and allows you to add descriptions to your images (ALT tags) which tells your visually impaired visitors exactly what’s going on in your pictures. GoDaddy unfortunately, doesn’t allow you to add ALT tags which I found a little disappointing. They do however, have a very cool and helpful “SEO Wizard”. 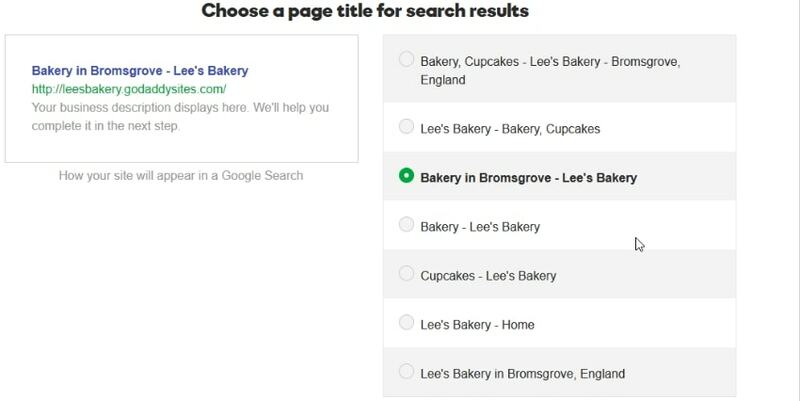 This wizard will walk you through and help you choose relevant words and phrases (keywords) that people may type into Google when searching for a business like yours, for example; Bakery + your town. This will increase the chances of people finding your website. Search engine summary: Weebly gives you slightly more control over your search engine settings. GoDaddy on the other hand, walks you through the basics with their “SEO Wizard” and helps you choose words and phrases that someone may type into the search engines when looking for a business like yours. Regardless of whether you choose Weebly or GoDaddy, you can sleep easy safe in the knowledge that if you need help, their support teams will have your back! When setting up your site, they both have a Youtube channel packed with videos showing you how to create your site and if/when you need support from a real person, you can get in touch with them both by phone, live chat, and an email ticket system. Help & Support summary: It’s a tie! Both Weebly and GoDaddy have video training, an email ticket system, or you can get in touch by phone or live chat if you need help in real time. Weebly offers a free website but be warned, it does come with Weebly branding at the bottom of the site and many of the features will be restricted whereas GoDaddy offers you a 30-day free trial which is more than enough time to test things out. *Note: The pricing you see below are as displayed on the providers pricing page. They’re in US dollars, and the monthly prices only apply when you choose a 1-year plan and pay upfront. I should also point out that other shorter and longer term plans are available but it’s the easiest way to compare. $8/ month for a basic business website or $12/month if you want additional features such as membership options, site search box, and HD video integration. Start selling products on any plan (transaction fees apply on the lower plans). Weebly will throw in a free custom domain name (web address for the first year). A custom email address to match your domain will cost an additional $5/month (approx). $5.99/month for their cheapest plan for very basic websites. $9.99 if you require social media integration, SSL Encryption (website security), and access to the search engines settings or $14.99/month if you want to jump into the email marketing platform. $29.99 if you want to create an online store. You’ll have to pay for a custom domain name if you want one at $11.99 annually, but GoDaddy will provide you with a custom email address at no extra cost. Pricing summary: Pricing is always tough to compare as you rarely find like-for-like plans. For a normal website, there’s not actually that much difference when you take into consideration domain names and email addresses. 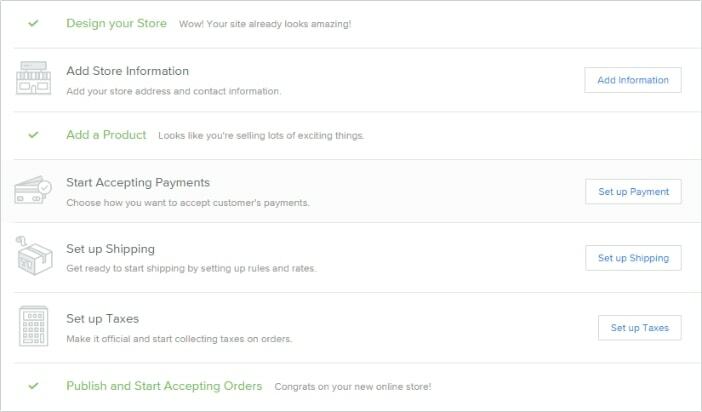 The difference shows when creating a store and Weebly is cheaper for getting started. Now we’ve reached the end of our comparison, have you been able to make up your mind as to which platform will best suit your needs? Weebly is the more flexible of the two and should be a serious contender for all types of sites including business, portfolios, small-medium stores, and blogs. Then we have GoDaddy which is a good option for small business owners who want to quickly create a website and don’t need a lot of customization options the “bells and whistles” that you get with other website builders. If you still haven’t made up your mind at this point, then I highly recommend creating a free account and spending a little time with each of them. After all, you can read comparisons forever but getting stuck in is really the only way to know which platform suits you best. 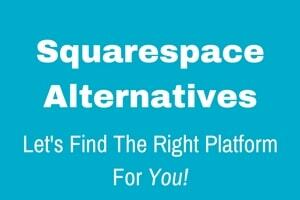 Which platform are you leaning towards and why? Let me know in the comments section below!